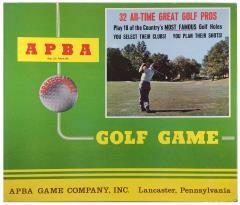 The APBA Golf Game was origionally published by APBA in 1962. It contained 18 Greatest Holes and came with 32 well known golfers. The 18 Greatest Holes publsihed in the 1962 edition contain 4 different holes than later versions of the 18 Greatest Holes. The courses and player cards included are random, and no particular course or golfer can be guarenteed.